Back in the second week of October I was contemplating writing my next blog post regarding my pursuit of the buck I called Trump. At that time I had not yet filled either of my Illinois buck tags and had hunted for Trump several times without laying eyes on him. In fact I was starting to think that Trump might be one of those bucks that was impossible for a bowhunter to kill, at least on purpose. I was going to title that blog post “Is Trump Unkillable” … but the fickle winds of trophy whitetail hunting started blowing in my favor in a way that I could not have even dreamed. To start things off, on October 15th I shot a 206” buck that I had named Smokey. It was the culmination of a 13 year quest to shoot my second whitetail over 200”. Just 2 days after shooting Smokey I did two podcast interviews and both times I was asked about Trump and what I thought my chances were of tagging him. Up to this point I was giving myself no better than 10% odds of even laying eyes on Trump in daylight. On both of those podcasts I dropped my odds to 1%; not a 1% chance of killing Trump but 1% of even laying eyes on him! I started really paying attention to Trump in the summer of 2016 when his rack exploded. He is the only buck that I ever created a spreadsheet to track every detail of every photo I got of him. I did this because I knew so little about him and was trying to gain whatever edge I possibly could. The spreadsheet included not only the obvious info like time and location of the photos but also every other detail I could glean from those photos. I noted things like the direction he came from when I got his photo and the direction he left, any other bucks that were with him, etc. I got a lot of photos of Trump in 2016. In fact I got photos from 8 different locations spanning 3 miles including photos taken just 17 hours apart at locations 3 miles apart. In 2017 the number of photos I got of Trump really went down. Often I would get only one photo from a location and then not get another photo from that camera, although if I would move it just a few yards I would again get a single photo. On the cameras where I did get his photo multiple times there was no pattern at all. I would get a random photo and then 3 weeks or a month later I would get another. I might add that all of these photos were after dark. Clearly Trump as on to the trail-camera game. Often as a buck enters older age classes he will become more active in daylight and his home range will shrink. That might have eventually happened with Trump but it sure didn’t happen in 2017 when he was 7 ½ years old. This left me with treestands scattered over his 3 mile range on any property that I could get permission to hunt. I might add that Trump was as “real world” as any buck alive. I don’t think he ever fed in a food plot or had a managed property within his home range. There were other hunters on every property where I had permission to hunt him. All of this factored in to giving myself only a 1% chance of laying eyes on Trump but it also figured into my plan that would eventually allow me to kill him. I figured that if I just randomly hunted the stands I had in place I would probably always be one step behind him. I knew that he had a summer range where he stayed until the crops were harvested and he would then shift to a fall/winter range. I had stands in both areas as well as between them. My plan was to stick to 3 stands within his summer range and hunt them every day possible until the crops there were harvested. These 3 stands would allow me to hunt all wind directions. There was one exception to this plan however; I needed a NW wind to hunt my other target buck Smokey so any time there was a NW wind I would not be hunting Trump but instead would shift my focus to Smokey who lived several miles away in a different county. With Trumps random wanderings I figured if I stuck to hunting a couple of stands where the wind was right, I might eventually be there when he passed through instead of jumping around and always being a step behind him. After shooting Smokey on October 15 I took a few days off from hunting to take care of some things and get my gear (and mind) back in hunting mode. I would now be focusing the rest of my season entirely on Trump. The afternoon of October 19 I climbed back into a stand in Trumps area. It was my 10th hunt for Trump since season opened and on those hunts I had yet to see a single deer, not even a doe. I knew that I would not see many deer hunting in this area but to sit for 9 hunts in the same 2 stands and not see a single deer was starting to test my patience. Still, I stuck to my plan because I knew it was my best chance for success. 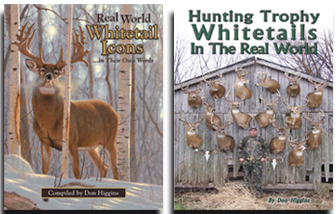 The wind was dead calm that afternoon and my stand was in a wooded fencerow looking out over both a standing cornfield and soybean field. With about 20 minutes of shooting light left I heard a cornstalk rustle about 30 yards out in front of my stand. I could tell by the sound that it was a deer moving through the standing corn so I stood in anticipation of soon seeing my first deer in 10 hunts. Within a minute Trump stepped out of the standing corn and into the soybeans just 30 yards away and immediately started walking right at me. I knew when Trump hit the treeline where I was waiting he would either turn right or left and give me a broadside shot so I drew my bow in anticipation. Trump turned to my left and I immediately released the arrow. The hit was not perfect and I watched as Trump ran about 100 yards out into the soybeans and soon bedded down. A few minutes later another buck walked out from the standing corn and got Trump back on his feet. I watched the bucks standing in the soybeans until it was dark and then slipped away. The next morning I returned with good friend and business partner Kevin Boyer along with Ron Slifer and his bloodhound Dio. I was concerned about the hit and didn’t want to take any chances on losing Trump. To make a long story short, after a long and stressful tracking job I finally was able to walk up and grab the antlers of the buck I thought I would never lay eyes on. I consider Trump to be my greatest hunting accomplishment even though his 193” rack is not my biggest. He pushed me into unfamiliar hunting territory and forced me to seriously rethink my approach every step of the way. I have been targeting one specific buck since 2004 when I targeted and killed my biggest buck at 214”. During that 14 year period, every buck I have targeted has been dead by the end of the season. Two of those bucks were killed by other hunters and the others I killed at some point during the first season I targeted them. Trump is the lone exception. When I targeted him during the 2016 season he survived not only my efforts but those of every other deer hunter within his range. I honestly thought I had met the unkillable buck. Trump certainly earned my respect and taught me many lessons that will make me a better deer hunter. To be able to wrap my hands around his antlers and put my tag on him was indescribable. When I began the 2017 season I dreamed that I might be blessed to shoot both of my target bucks. To shoot both on back-to-back hunts was not something I could have dreamed. To do it in Mid-October is beyond imagination. I often tell others to “Dream big because Gods reality is so much bigger than we can even imagine”. This season those words came home to me in a BIG way! Thank you for sharing your story with us. I have been following it since last year when you were on wired to hunt. I have never really been a guy who goes after one buck until this year when I got trail cam pics of a young stud on public land. He is a tall, no spread bucks with big brow tines. I have cameras up right now where I think he may be. If he survives this year I will be targeting him in big woods next year unless I find something a little closer to home. After reading your story, I have one question. Do you have a target buck for next year now that you have killed your hit list bucks?